Two Centaure Regular New Model Armies from left: 2nd variation RNMA, 3rd variation RNMA. LJW....Gorgeous! I especially love the grips on the one on the left. Would you mind shooting a close-up? Thinking about redoing the grips on my Army and that would be it! I can send these pics to you by PM in high Resolution. That does just fine, Long Johns. I really appreciate your contributions to the forum. You have some very rare and desirable guns! Plus, you show pictures....we loves pitchurs! A good friend from Montana let me liberate this Centaure RNMA 1st variation 1st sub-variation from his collection in October 2016. She looks almost new. What is cute about her? No visible serial numbers. Where the visible serial numbers should be stamped the pistol is marked M.
M for Model gun. What a find. You can see the actual serial numbers only when the pistol is disassembled ... which is #4 ... except for the cylinder which is #644. While barrel and frame are stamped with the inspector mark * over R (sideways) for Sylvain Wegemans - served at the Liège Proof house between 1951 and 1965 the cylinder is stamped with * over U (sideways) for Jacques Fuchs - served 1960 to 1968. If this were a Centaure with all matching numbers the cylinder were stamped #4 and the inspector mark were like the one on barrel lug and Frame, i.e. * over R! An indication that the cylinder was exchanged at one time during the life of this RNMA. The $ 100000.00 question here is: why would the cylinder of a model gun need replacing? Any thoughts? This is a Centaure from the first production batch in 1959. I am very happy to have M#4 in my Centaure herd. Before you ask only 3 Centaure Model guns have surfaced and are documented, namely M#1, M#4 and M#5. We have #3 in the Centaure data bank which is a "regular" production RNMA. The whereabouts of #2 are currently unknown. Based on our research since summer of 2007 the total productionb output was between 16,000 and 16,000 Centaures only. They were produced between fall of 1959 and early summer 1973 in just 5 models (Regular New Model Army (RNMA), Civilian Model, Cavalry Model, Pocket Army Model, Marshal Model). The official launch was 1960 in the USA with #1 RNMA followed in summer of 1960 with the #2 Civilian Model. Another Centaure Story: Regular New Model Army #5000 is a run-of-the-mill RNMA 1st variation 2nd sub-variation from 1966. In other words a classic Centaure. We learnt about her in December 2015 only. I bring her to your attention because she is another Centaure with a history. During the proof testing procedure back then the Liège Proof House selected her for a torture test. They fired 200 balls through her without cleaning. When #5000 made it through this test with flying colors she was not added to another order of Centennial Arms Corporation of Lincolnwood, IL, the Centaure distributor in the U.S.A.
She was honorably transferred to the Hanquet collection instead, owner family of Fabriques d'Armes Unies de Liège (FAUL) and makers of the Centaures. Thanks for posting. Maybe someday I'll come across the right one at the right price? The price is in Europe 15 Euro. Discription in english. Do you need more information about it? That's a great little booklet covering all Centaure models, variations and sub-variations. US pards like to take the booklet to gunshows for an easy identification of Centaure variants. 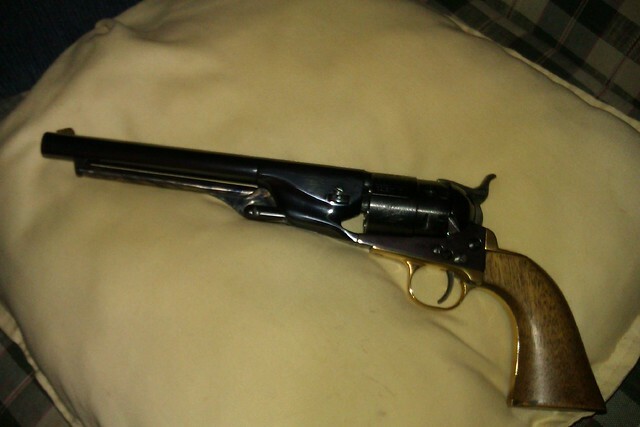 Every C&B revolver aficionado should have one (I have two, ha).